At least 12 people have been killed and dozens wounded by a bomb targeting police recruits in eastern Afghanistan, officials say. The blast happened in the Sorkhrot district of Nangarhar province. The recruits were travelling to the capital Kabul when the bus was hit by a remote-control device in a motorbike, a local official told the BBC. 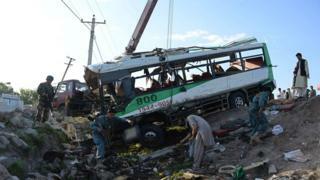 Other reports suggested a suicide bomber had rammed the bus on the motorbike. A Taliban spokesman, Zabihullah Mujahid, said the Islamist group had carried out the attack, according to the Reuters news agency. Taliban militants have previously targeted officials in Jalalabad, the capital of Nangarhar. Ahsanullah Shinwari, head of the Jalalabad hospital, told the Associated Press that 12 bodies had been brought to the hospital. Hours earlier, a bomb hit a minibus carrying Education Ministry workers in eastern Kabul, killing two people and wounding seven, a defence ministry spokesman told Reuters. Two districts in the Nangarhar province are controlled, or at least influenced, by the so-called Islamic State (IS).